Orchard Court residential home provides 20 specialist placements for persons with varying degrees of learning disability. 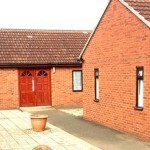 Wheelchair access throughout the home enables us to cater for a variety of needs. Professionals strive to maintain the dignity, individuality and privacy of all service users within a warm and caring atmosphere and are sensitive to the service users’ ever changing needs. Service users are encouraged to participate in the development of their individualised plan of care & support and the involvement of family and friends is greatly valued.